Welcome to our blog where you will find lots of industry related news, tips and advice. We signed a contract and have started working with Claims Consortium Group! An afternoon at Leeds Castle, reflecting the positivity provided by the EU Grants. 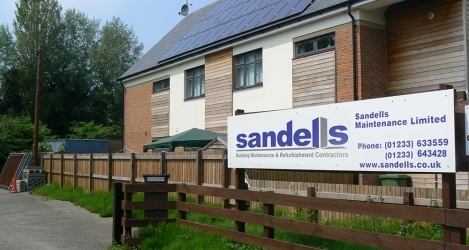 Sandells sign a contract with Family Mosaic. Denne Mentor Sandells Maintenance Ltd! Denne have been awarded funding under the Government's Employer Ownership of Skills programme. Denne funded 10 of our Operatives a days training course for Working at Heights including Safe Use of Harnesses and Ladders. In November 2012 Sandells was awarded STEM Silver award. Now Jenny Berkhauer has achieved STEM Gold award for Sandells. Sandells Maintenance Ltd was awarded ISO9001 accreditation! Lovely sunny day at the races. Pimms, lunch and afternoon tea! Sandells Director, Guy Barrett, sailed Sandells successfully through their stage 1 audit for ISO9001. The Directors of Sandells Maintenance meet HRH Princess Anne. The Directors Guy Barrett and Jenny Berkhauer were given the honour to meet HRH Princess Anne at a tree planting ceremony in Godmersham by their customer English Rural Housing Association. All of the Sandells Maintenance Ltd staff complete their Asbestos Awareness Training course!! All of the staff and sub contractors from Sandells Maintenance Ltd are how fully trained in Asbestos Awareness. Lots of people at the show enjoyed their goodie bags and green "footprint" cake pops! Sandells are joining in ALL the fun at the Energy Fair in County Square! Sandells are having a stand at the Energy Fair in County Square Ashford, on Saturday 19th January between 9am and 5pm come and see us for free energy saving advice. Kaddy Lee-Preston will be there from 12 noon until 4pm. Sandells Maintenance Ltd gains their Stem Silver Level! Having gained Blue Level we have been working hard on our Environmental Management System and this week we have gained Silver!! Are your office premises ready for winter?? Sandells can offer a large variety of services to get your office ready for the winter. Do you need lighting inspected and replaced in or outside of your premises?? Does your guttering need clearing?? Is the roof to your premises ready for bad weather?? Is your car park in a good condition ready for the frost?? Do your paved areas need salting?? Or is the inside of your office looking dull in the dark weather and could do with a spring clean or freshen up?? If so, we are here and ready to help, we will even sing Christmas Carols for your staff as we work!!! Sandells has completed uplifting the old flooring and replacing it with new Altro Walkway non slip vinyl in 5 blocks of 10 communal hall, stairs and landings, on behalf of Graham Martin Decorators for Ashford Borough Council. Our first exhibition stand at Chatham Dockyard was a success! The winner of our giant cupcake is announced after we raised £100 for the British Red Cross.